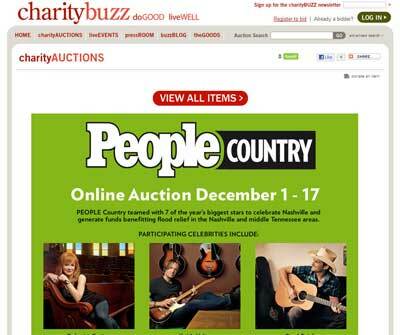 People magazine and charitybuzz present an exclusive auction for country music fans that will benefit flood relief in Nashville and the middle Tennessee area. Exclusive photos of country stars including Reba, Lady Antebellum, Taylor Swift and Brad Paisley in their favorite Nashville places are currently on display at the Hutton Hotel in downtown Nashville. These photos, which are also featured in the December 2010 issue of People Country, are up for auction here.